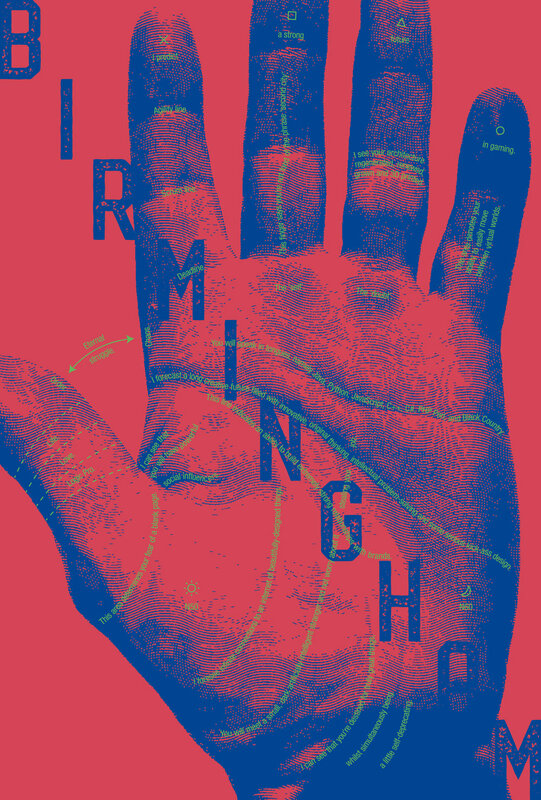 Birmingham Design Festival Poster. Concept. Design. Art direction. Copywriting. Illustration. Artwork. I wondered what we’d see if the city had its palm read. This context, and it’s possible results, are what shaped my response. Press advertising. Concept. Design. Art direction. Copywriting. Retouching. Artwork. Appearing in an awards programme means sitting beside a sea of other ads. 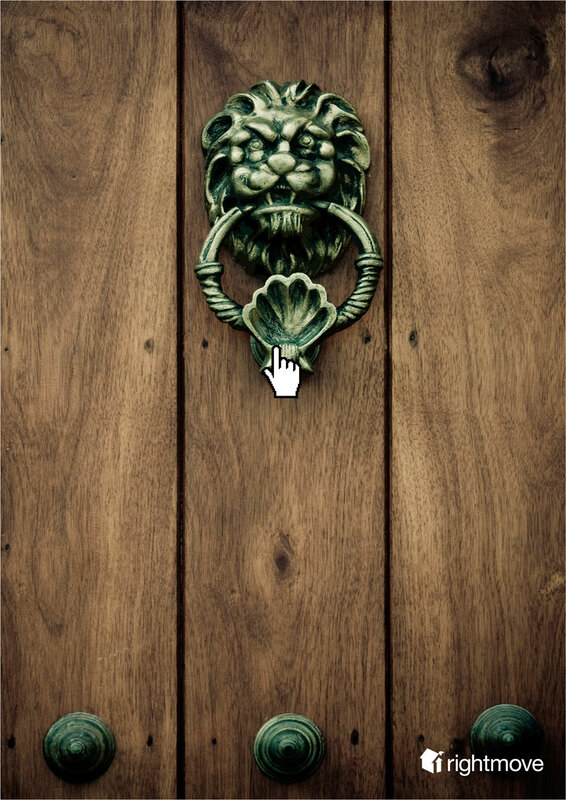 To make this client stand out, I eschewed a technically-led route and opted for the kind of confidence and intelligent humour that a market leader can own. Not easy when you can only use stock. Press advertising. Concept. Design. Artwork. 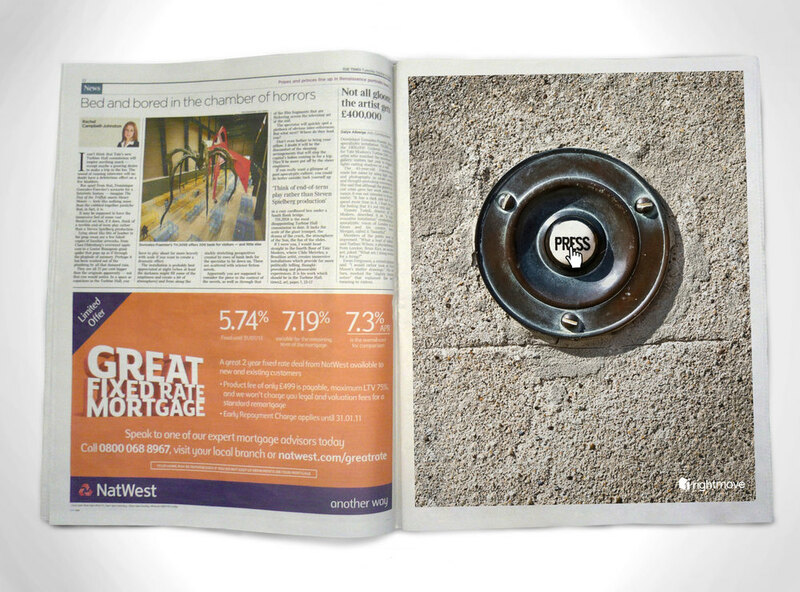 With limited ad space (and time) we created an award-winning piece of work which immediately informed the customer of the benefits of using Calor LPG. Direct Mail. Concept. Visualisation. Copy. 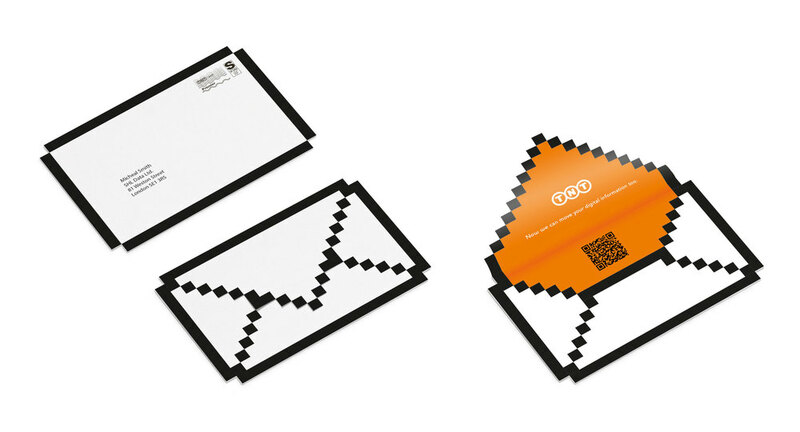 This piece of direct mail literally placed TNT's new digital service into the hands of their target audience. Truck Livery. Concept. Design. Art direction. Retouching. When Topps Tiles wanted new vehicle liveries, I decided to tile the truck, turning each side into a canvas on which to display their best products. By using scale product and tradesmen, I created an unforgettable ‘tiling on the move’ visual that was adaptable and as varied as their stock. When BHX wanted to re-brand, we ignored all the noisily-competing airports and created a platform which enabled the airport to open a dialogue with their customers. The platform enabled us to carry the graphic elements and welcoming messages across all areas, transforming the airport exterior. The platform provided Birmingham Airport with a confident, aspirational and friendly tone of voice. This helped position them as an ambitious, global gateway that cared for it’s visitors. Music to investors’ ears. Posters. Concept. Design. Art direction. The platform enabled us to create a natural conversation when speaking to our customers. Engaging, informative and friendly. The 'Hello World' platform created a friendly, all-inclusive tone of voice. Brochures. Concept. Design. Art direction. 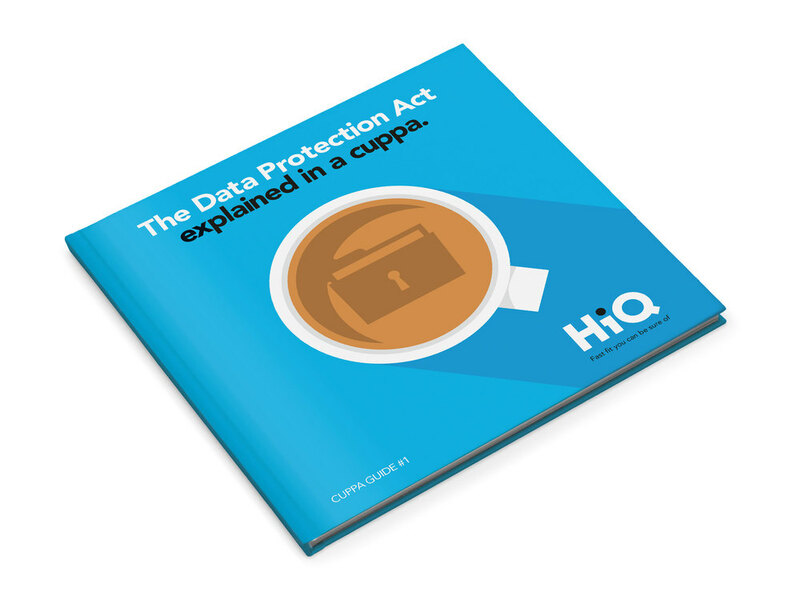 To make complicated information easy (and enjoyable) to digest, we created 'The Cuppa Guides.' An easy way to engage and inform staff, in the time it takes to have a cup of tea. Press advertising. Concept. Design & Layout. Copywriting. 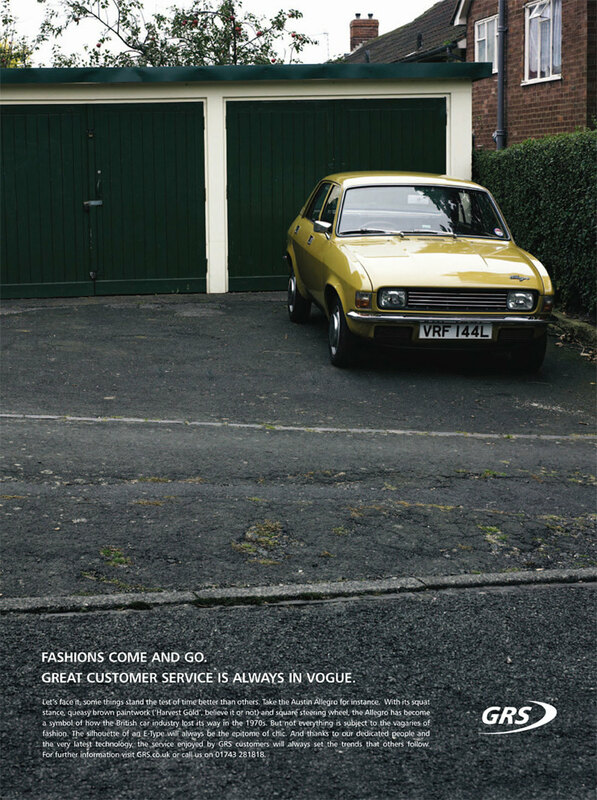 This ad communicated Bridgestone’s sponsorship of The Sunday Times 2018 Motor Awards. The pithy, attention-grabbing headline and visual combination, underpins their technical excellence and attention to detail, without the need to show a tyre. Press advertising. Concept. Design. Art direction. Managers don't buy trucks on looks. That's why we created an original solution which assures the right people that a Scania is just as great on paper. Direct mail. Concept. Design. Art direction. The paper-based art direction worked perfectly for all sorts of DM. Exhibition stand. Concept. Design. Art direction. The paper-based art direction created an attention-grabbing exhibition stand. Sales Promo. Concept. Design. Art Direction. Get well soon, got a subtle twist to promote Lemsip Max Strength (their fastest working remedy) and provide the perfect mechanic to carry a money-off voucher. 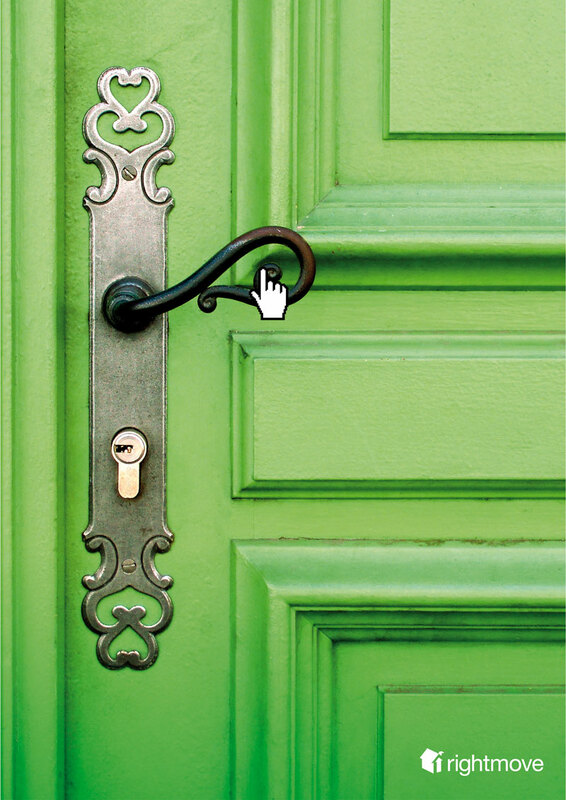 When Countrywide wanted to supply energy to it's customers, this striking memorable visual made sure their door drop didn't go unnoticed. 'What you don't know could hurt you' was the platform we used to make customers aware of what they risk if they don't use Finning fluid analysis. Direct Mail. Concept. Art Direction. Design. Masterlease provide a comprehensive fleet management service covering everything from financial to legal. We communicated all this succinctly under the concept of 'The Zen of Fleet Management' promoting Masterlease as the reliever of fleet stress, with a pack containing everything you need to de-stress yourself and gain fleet enlightenment. Posters. Concept. Art Direction. Copy. To help sell the re-relased Hobbit audiobook, we created an arresting visual to express the immersive experience of listening to an audiobook. Branding. Name Generation. Branding. Design. Illustration. Artwork. To stand out in the sea of event companies, we created a considered, confident brand that talked to it's customers with clear visuals and a friendly tone of voice. The results were instantly memorable. Press advertising. Concept. Art Direction. Design. Illustration. 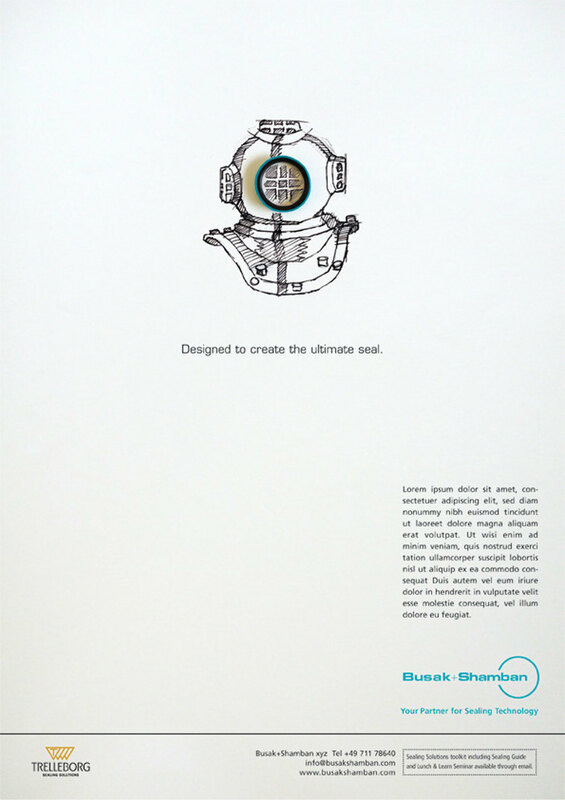 This innovative and clever campaign helped our client sell their seals, highlighting their benefits with charming illustrations and pithy headlines. Direct Mail. Design. Art Direction. Artwork. This Christmas card helped promote Sealine's considered and stylish ethos by using a modern illustration style to create a festive visual. 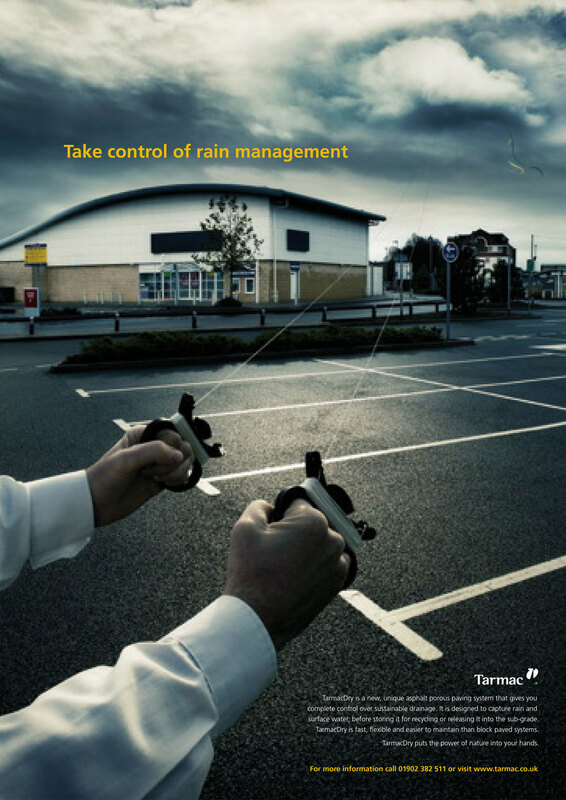 The idea of this dramatic visual, helped TarmacDry communicate all the product benefits in more engaging manner. Posters. Concept. Copywriting. Design. Art Direction. Every gym advertises in January, so to create more buzz, we put a unique spin on the january sales with engaging headlines and (attainable!) visuals. Outdoor. Concept. Design. Art Direction. We tailored the creative to make the most of the medium and sell the load carrying benefits of the LDV Maxus. Press advertising. Concept. Art Direction. Using individual and original imagery, enabled us to promote the benefits of GRS fleet leasing services, in an engaging way, creating a unique tone of voice and avoiding clichéd business visuals. The platform provided Birmingham Airport with a confident, aspirational and friendly tone of voice. This helped position them as an ambitious, global gateway that cared for it’s visitors. Music to investors ears.